The 7.8-inch screen on the Kobo Aura One makes it better suited for larger-form content like comics and manga than the more common 6-inch ereaders. 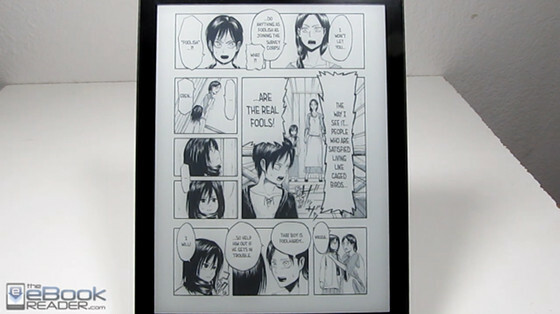 The 7.8-inch 300 ppi E Ink screen does indeed look great for text and graphics when it comes to comics and manga. Text is sharp and easy to read and images show a lot of detail. However, Kobo’s software could be a lot more optimized for comics and manga. Performance varies from title to title. Some turn pages super slow and some start to freeze and glitch out when pinch-zooming. Other comics turn pages faster and zoom a bit smoother but performance is pretty inconsistent overall. As far as features, comics and manga have landscape mode as an option but you have to scroll up and down the page and it doesn’t always work smoothly and often just turns the page instead. The zoom level remains when turning pages, which is nice. You can use pinch-zooming but it’s usually too laggy to be functional. There’s a zoom dial from the menu that works a lot more smoothly. The page slider is present for comics to navigate a book, along with the table of contents. You can add and remove bookmarks by tapping the upper right corner but oddly there is no way to access them from within a comicbook—only from the homescreen. Kobo offers a number of comics and manga titles from their ebook store. I tested a few freebies with varying results. The first one shown in the video review works pretty well but the second takes like 4 seconds to turn pages. Like all Kobo ereaders, the Kobo Aura One also supports sideloading comics from other sources in CBR and CBZ format. The ones I tested worked okay and were easily readable thanks to the larger screen, but pinch-zooming and scrolling are so bad they’re basically unusable, so as long as you don’t need to use those things it works pretty well. The video below shows how the Kobo Aura One handles a few different comics, manga, and CBR files.